There is nothing more relaxing than spending time soaking in a natural geothermal hot spring! 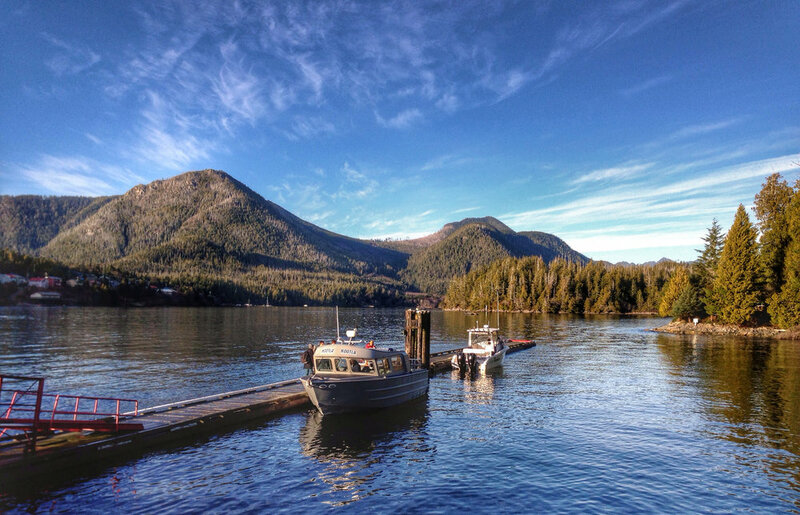 Hop aboard the Hot Springs Cove tour to Maquinna Provincial Park, 27 nautical miles north of Tofino. 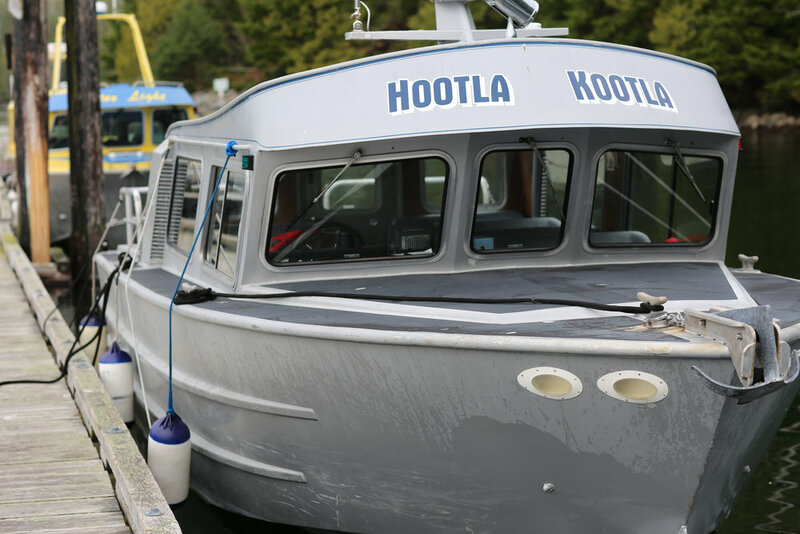 Travel by boat to Hot Springs Cove or ask about our sea-to-sky trip. 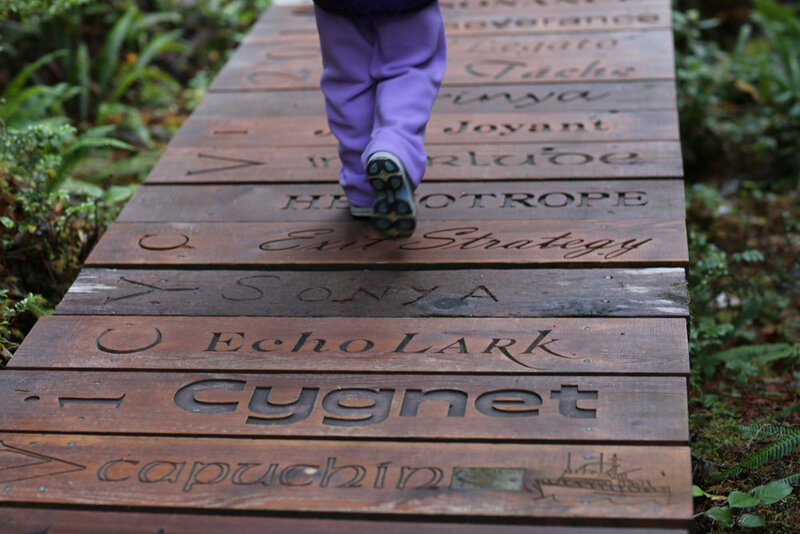 Once arrived at the dock, walk the 1.5 km boardwalk trail through old growth forest. The walk in is half the fun, the trees are so beautiful and the path is a cedar boardwalk with carved out ship names and messages from previous guests. At the Hot Springs, you have two hours to soak your worries away in the succession of pools. As the tide comes in some pools get cooler while others are far enough away to stay pleasantly warm. Be sure to splash around under the waterfall. Enjoy the vast Pacific Ocean views and the crash of the waves as you relax in the Hot Springs pools. Bring your picnic lunch! 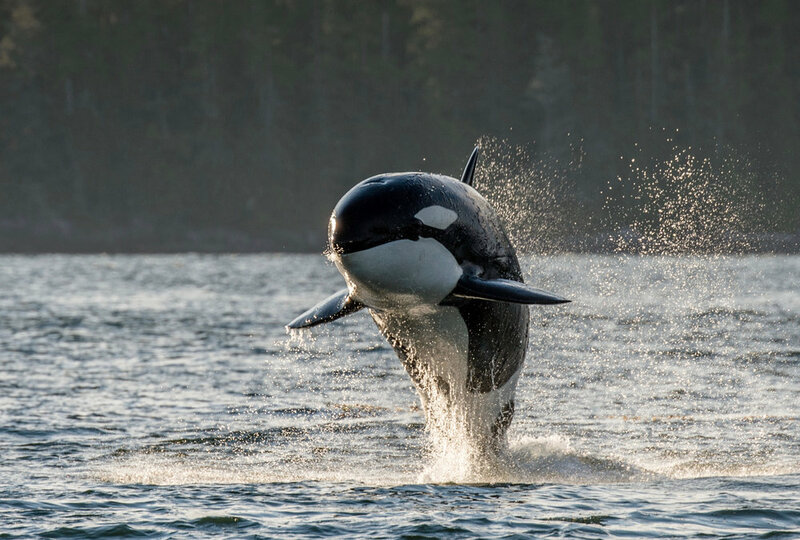 The Tofino Hot Springs Tour includes soaking in the Hot Springs, walking through the rainforest on a cedar boardwalk, viewing marine wildlife and a scenic boat ride through Clayoquot Sound. 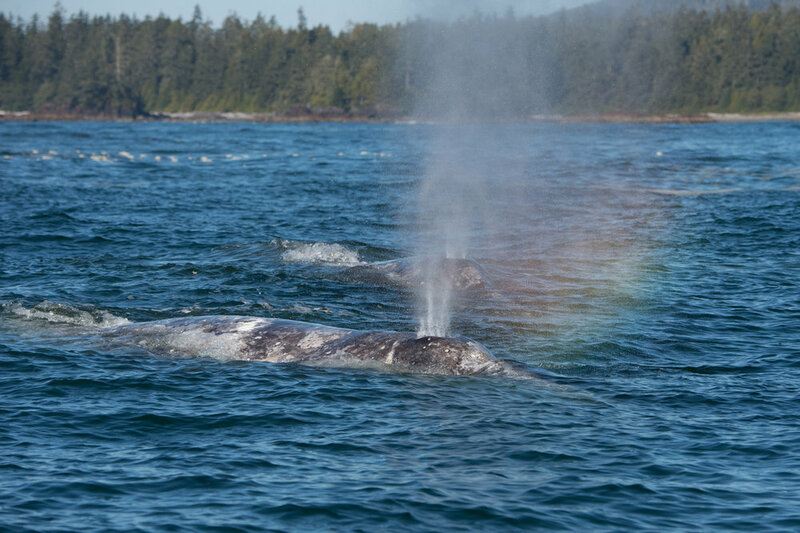 This tour should be on your Tofino Must do List! Read about Sunset Magazine’s epic adventure up to the Hot Springs with us! 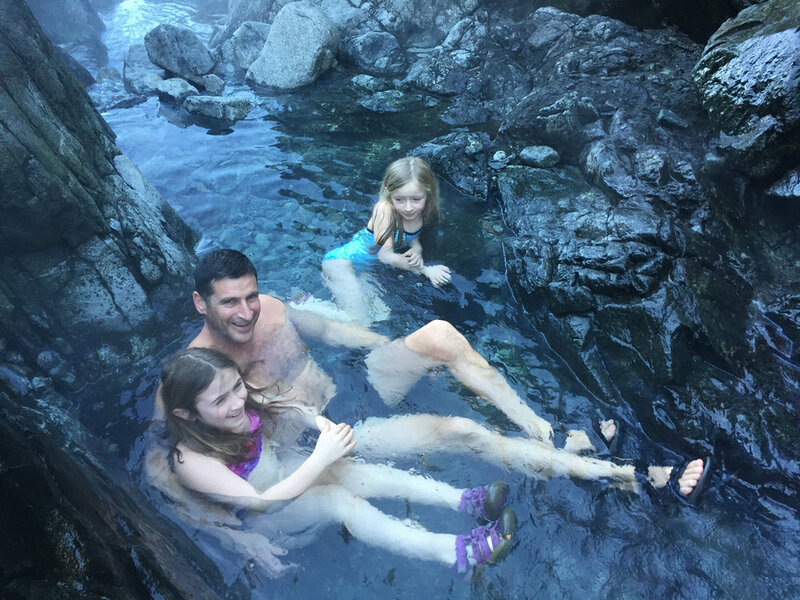 Our Hot Springs Tours are offered year round (weather permitting) from Tofino, British Columbia. 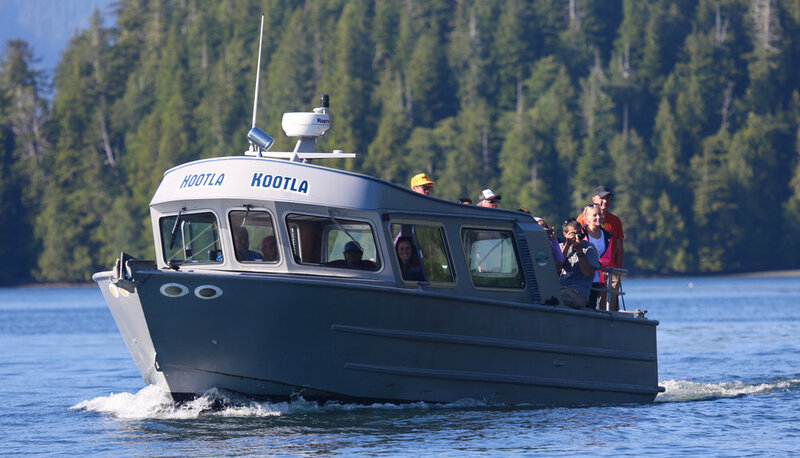 Our Tofino Hot Springs Tours departures are scheduled aboard our heated cabin style vessel the Hootla Kootla, but open Boston Whaler boats are available upon request in the spring and summer. Be prepared for some walking! The Hot Springs are accessed via a boardwalk that winds through old-growth rainforest for just under 2 km (1.2 mi) or allow 30 - 40 minutes. There are some stairs but the boards of the walkway are carved with the names of ships that have visited the park, making for an entertaining walk. When you arrive at the Hot Springs there are outhouses and change rooms and a covered seating area. Be prepared for a little rock scrambling. The Hot Springs mineral pools are nestled in a rocky shoreline, fed by a cascade of warm water running from the forest. Once you are in the hot springs, you’ve got your choice of several pools, that decrease in temperature the closer you get to the ocean. From the waterfall splashing into the pools, to the trees towering on cliffs all around, to the view of the ocean and wide, open sky above – it’s truly a special place. After some serious soaking, head back to the dock to catch your ride home. The return trip home is no ordinary boat ride. 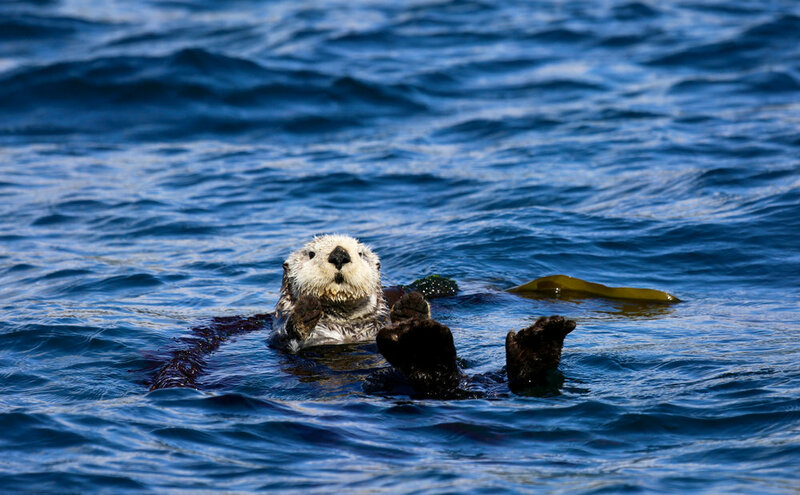 Often times wildlife can be seen, such as grey whales, killer whales, bald eagles, sea otters, sea lions and wolves along the coastal shores of Clayoquot Sound. How hot are the Hot Springs: 50 degrees Celsius! The Hot Springs Cove boardwalk is 2 km and can be slippery and wet so wear good footwear and be mindful of the boardwalk conditions. Occasionally, in the spring and summer our Hot Springs Tours are operated aboard an open Boston Whaler vessel. You are provided with protective floatation suits, gloves and toques. The Tofino Hot Springs are naturally sulphurous, so expect a natural aroma. Dogs are not permitted in the Hot Springs park. Picnic lunch and water, there are no stores at Hot Springs Cove. A 30 foot deluxe custom built covered cabin cruiser with extra wide padded seats, a heater, state of the art navigational equipment and an extra large stern viewing deck to spot wildlife. Want to boat one way and take a float plane other way? Check out our Tofino Sea to Sky option.